Reversed Age Technology – Cover Story! – Super Moon! Yesterday I was not around at home at all because I had one of the earliest Tijuana Adventure tours ever…. I crossed the border around 9:30 am to meet with Ed and Eleanor from Melbourne, Australia. Ed has family in Los Angeles so apparently they visit frequently enough that a trip to Tijuana was due. Since it’s a couple, I like to invite a friend on a tour to even things out, and my friend Natalie joined me. Everything is basically empty and closed before noon in Tijuana, but I managed to deliver them with vegan tacos for breakfast that they adored. Then we walked around for a long time as I explained the city. Ed just wanted two things out of the tour, customized leather boots form a tiny and really hard to find boot store (turns out it was by my apartment), and a bottle of great tequila. After the tour, which ended before 4 pm, me and Natalie went to drink ‘especiales’ at Nelson Bar for a while. It was good catching up with her. Especiales and a great conversation always makes my day better. After that, I went home, got hungry, burger place was closed, so once again I went to get Korean tacos. Didn’t do any work except the tour. Today I have another tour. A free tour. A friend of a friend who I guess is coming from Canada, so why not. I’ll take him to drink some more beers. I have to add more stuff for the cover story. And I’m kinda stuck. That’s why I’m writing here right now. But it’s coming along I think. On Saturday the Reader’s photographer is coming to find what picture would be great for the cover. Also finish two food reviews, interview some people, and finish another article. All of it preferably by tomorrow. Which most likely will extend to the weekend. Weekend of work! That’s what I get for procrastinating and blaming writer’s block. 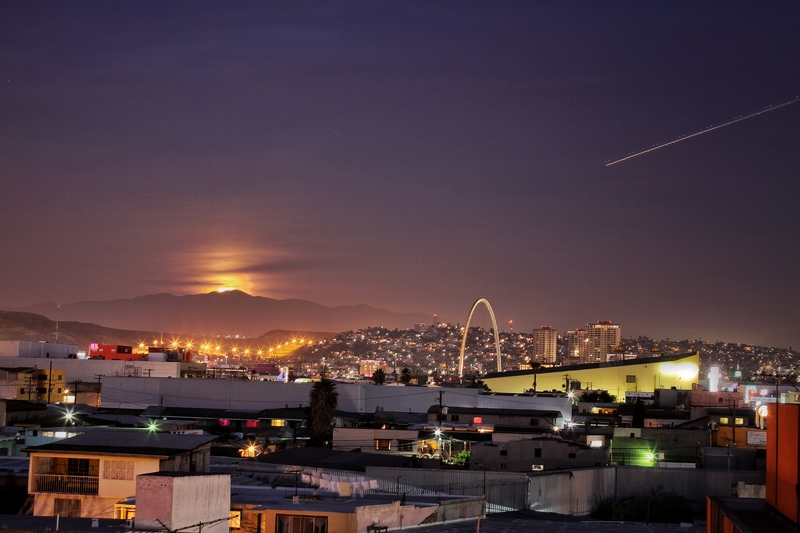 The super moon rising over the border is now my most liked picture on Instagram (I think). It’s not even the final product! The idea is to layer 20 more pics on top of this to see the super moon rising in different times. I don’t have time to play with Photoshop and do that right now, so that will have to wait. Imma gonna post that on Reddit and see how it goes. Ok. Back to work + coffee, then breakfast, then shower and a shave, and more work before going to grab beers! I can do this!